At a news conference in Pyongyang on March 15, 2019, North Korean Vice Minister of Foreign Affairs Choe Son-hui said the DPRK was considering suspending further talks on denuclearization with the US. According to Choe, the US is obsessed with its own political interests and is not sincerely interested in achieving results, and thus, missed its “golden” opportunity to reach an agreement at the summit in Hanoi. 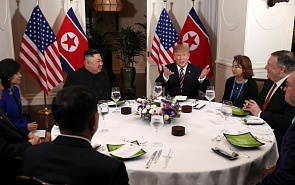 Choe Son-hui noted that it was the US representatives that “created an atmosphere of hostility and mistrust, thereby obstructing the constructive efforts of the supreme leaders of the DPRK and the US at the talks, as a result of which the summit ended without a meaningful result. She added that the North Korean leader intended to announce a decision on further action in the near future. Choe Son-hui’s tough tone evoked apprehensions that the relaxation of tensions was over. According to one leak, Kim will return to the issue in about six months and will maintain the moratorium on nuclear tests and missile launches during this period, but will not take any new steps in expectation that America will reciprocate. However, considering that only one man makes decisions on such issues in North Korea, Choe’s statement could be interpreted not only as a change of course but also as an attempt to up the ante in the bargaining strategy until Kim speaks out himself. In his annual New Year address Kim reaffirmed his willingness to talk but noted that if there was an attempt to coerce his country into making unilateral concessions, “we will probably have to look for a new option to defend this country’s sovereignty and the supreme national interests, and to ensure peace and stability on the Korean peninsula.” This is why any unbiased analyst takes into account the possibility of such developments. At this point (March 17, 2019), it is easier to comment on certain important details from Choe’s remarks. First, she confirmed that the rift had occurred during the last round of the expanded-attendance meeting. The blame is poked not only at National Security Advisor John Bolton but also Secretary of State Mike Pompeo. This is an indirect confirmation that the US suddenly came up with additional proposals that had not been discussed beforehand and were not made by Trump. As before, Choe confirmed the good relations between the two leaders. However, in the context of North Korea’s ideas of a hierarchy, “willful” statements by Trump’s entourage show that he is unable to control his subordinates. Second, Choe mentioned a very interesting detail, notably, that before his departure for Hanoi, Kim received numerous petitions from citizens and work teams with a request “to not give in.” Of course, it is difficult to believe that this initiative came “from below” but this may be a hint that in the DPRK, like in the US, there is no consensus on the subject of talks. Again we see the two approaches that form a vicious circle based on an “I know that you know I know…” approach. Kim understands that Trump’s successor, whoever he is, will hardly pursue a course for dialogue. Also, it is unclear how long Trump will be in power. So “will all due respect,” Kim will not give up everything in one go. He will take measures to create a reserve for a rainy day in case talks break down, because nobody can give him guarantees of security and stability. In turn, both the hawks and pragmatics in Washington understand that Kim will not disarm under these circumstances because there is nothing to gain from the act. But if there is no benefit, why then conduct talks at all? Neither can we disregard the domestic political situation in the US. If a pragmatic view prevails, Trump, for whom domestic politics is much more important than any foreign policy achievements, could get the lay of the land and come to the conclusion, for the same practical reasons, that the image of an adamant leader who has exposed attempts to cheat him will enhance his ratings to a greater extent, while he can always find an excuse to change course. Choe’s third interesting remark was about Seoul, which she called a gambler and Washington’s ally rather than an arbiter. Indeed, the current South Korean leader is largely motivated, not by a striving for dialogue but by vanity, populism and the logic of factional infighting that is prompting him to support what his opponents are opposing. Seoul’s mediation was fairly specific and, as I believe, progress at the talks was made when the North Korean and American diplomats began to communicate directly … and it transpired that the other party was not at all ready to accept just any terms. No doubt, Moon Jae-in did much to relieve tensions between the two Koreas, especially in the military area. But the question of how long he will last and what his successor will do is hard to answer just as it is with Trump. The South Korean President has enough problems with domestic politics and the economy, and his ratings largely depend on his inter-Korean achievements. The lack of progress in relaxing tensions will undermine his position and limit his chances to stay the course for dialogue. It is probably inaccurate to suggest that the Kim-Trump talks have run out of steam. There is a pretext for holding talks and a certain level of trust between the two leaders. The two pragmatists have managed to find an alternative where “a striving for disarmament” is more important than the speed of a disarmament process. In an ideal environment, this process could last for years with a de facto suspension of the conflict. However, the pressure of external circumstances is increasing and could prevail. There are several alternatives in this respect. First, this is the combined position of Moscow and Beijing in the UN Security Council and elsewhere. Second, it could be a return to the six- or five-party (minus Japan) format of talks. But what should be done, if the talks fail completely? In my opinion, the “complete failure” means at least a backsliding to the situation in the late fall of 2017, when the probability of a military solution or an armed conflict exceeded 50 percent, as I saw it. In this case, Russia should not only take measures to prevent such a conflict but should also be prepared to minimize the consequences for itself, if an armed conflict does break out. This implies the strengthening of air defenses against inadvertent incoming missiles, construction of infrastructure for receiving likely refugees, as well as accumulation of resources and recruitment of specialists for possible humanitarian operations on the peninsula, etc.